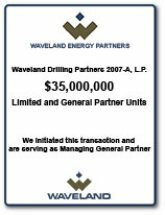 Waveland invests in oil and gas exploration and development throughout the Mid-Continent and Permian Basin regions of the United States alongside many of the largest and most active E&P companies in North America. 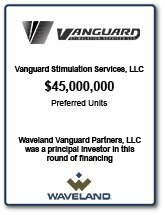 In addition, Waveland has deployed invested capital to special private equity opportunities in select sectors such as medical device, health sciences, technology, and manufacturing. 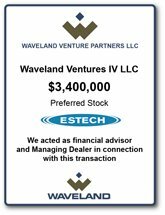 Please view the below tombstones of Waveland’s portfolio of investment activities. Waveland Resource Partners IV, L.P.
Waveland Resource Partners IV, L.P. is the fourth in a series of diversified oil and gas investment funds formed by Waveland Energy Partners LLC to enable qualified accredited investors to participate in the acquisition of ownership interests in a diversified portfolio of oil and gas investments. The Fund's investments are located in the Anadarko Basin in western Oklahoma, the San Juan Basin in northwestern New Mexico, the Permian Basin in West Texas and the Bakken Shale in northwestern North Dakota. 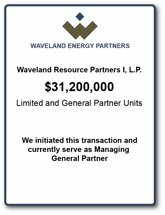 Waveland Resource Partners III, L.P.
Waveland Resource Partners III, L.P. (the "Fund") is an oil and gas investment fund targeting a diversified array of opportunities in the oil and gas sector (the "Projects"). 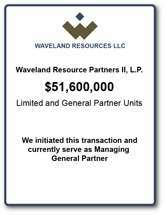 Waveland Resources LLC ("Waveland" or the "Managing General Partner") will manage the Fund and will employ a "multiple project, multiple operator" strategy. The primary geographical areas of focus are in the Mid-Continent and Permian Basin areas of the U.S.
Waveland Drilling Partners Series III (the "Program") is a series of partnerships formed to enable Investors to participate with Waveland Resources LLC, a Delaware limited liability company, to own working interests in oil and natural gas properties located in the Mid-Continent region of the U.S. The specified properties are "dewatering projects" where hydrocarbons are known to be present, and which are presently expected to comprise the Program's entire portfolio. Waveland Resource Partners II, L.P.
Waveland Resource Partners II, L.P., a Delaware limited partnership (the \\\"Fund\\\"), is an oil and gas investment fund that has been formed to enable investors to participate with the Managing General Partner of the Fund, Waveland Resources LLC, (the \\\"MGP\\\"), in the identification and acquisition of emerging and developing resource plays. The manager of the MGP is Waveland Energy Partners LLC, which was founded in 2001 to participate in oil and gas projects with industry partners. 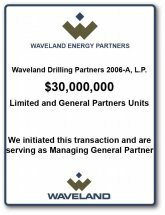 The Waveland Energy 2011 Drilling Program (the “Program”) is a series of partnerships (the “Partnerships”) which Waveland Energy Partners LLC, a Delaware limited liability company (the “Managing General Partner”), has formed to enable Investors (the “Investors”) to participate with the Managing General Partner to own working interests in oil and natural gas properties located in the Mid-Continent region of the U.S. The specified properties are “dewatering projects” (the “Dewatering Projects”) where hydrocarbons are known to be present, and which are presently expected to comprise the Program’s entire portfolio. 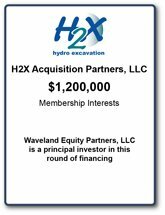 H2X, LLC is a hydro excavation company specializing in excavation for the oil and gas and utility industries, construction and numerous other industrial applications. Using high-pressure water and a powerful vacuum system, H2X crews expose underground utilities or trench areas of varying sizes much safer than traditional methods such as back-hoes or other mechanical digging machines. Hydro excavation is suitable for any digging situations, but is especially effective in dangerous environments, confined spaces or instances where the underground environment is uncertain, delicate or expensive. H2X can uncover pipelines, phone lines, fiber optics – and other infrastructure buried up to 35 feet underground – quickly, safely, and without damaging expensive or hazardous lines. Additional services include potholing, slot trenching, or any other non-destructive excavation applications – even as simple as swimming pools. The Company’s capabilities also allow its operators to dig up to 300 feet away in any direction if needed. More information on the company's products can be found at www.h2xinc.com. Waveland Drilling Partners 2011-A, L.P. 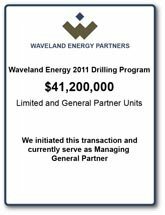 The Waveland Energy 2011 Drilling Program (the “Program”) is a series of partnerships (the “Partnerships”) which Waveland Energy Partners LLC, a Delaware limited liability company (“Waveland” or the “Managing General Partner”), has formed to enable Investors (the “Investors”) to participate with the Managing General Partner to own working interests in oil and natural gas properties located in the Mid-Continent region of the U.S. The specified properties are “dewatering projects” (the “Dewatering Projects”) where hydrocarbons are known to be present, and which are presently expected to comprise the Program’s entire portfolio. Waveland Resource Partners I, L.P.
Waveland Resource Partners I, L.P., a Delaware limited partnership (the “Fund”), has been formed to enable investors (the “Investors”) to participate with Waveland Energy Partners LLC, a Delaware limited liability company (“Waveland” or the “Managing General Partner”), to become “early investors” in creating large, long-term legacy oil and gas assets that can potentially generate cash flow for many years. Waveland Drilling Partners 2010-A, L.P.
presently expected to comprise the Fund’s entire portfolio. Venture Aircraft, Inc. is a leading manufacturer of precision crafted sheet metal, machined components, kits and subassemblies for the aerospace industry. It specializes in complex, flight-critical control assemblies that contain a large number of precision machined parts. The Company’s products go into some of America’s highest performing commercial and military aerospace vehicles including the entire family of Boeing commercial jet airliners, most United States military airlift and fighter aircraft programs as well as many helicopter programs. Customers are the prime U.S. government aerospace contractors, including eight different divisions of Boeing, Lockheed, Ducommun, Spirit AeroSystems, and HITCO Carbon Composites among others. Revenues are split between government (40%) and commercial business (60%). The Company produces a diverse array of aerospace components and subassemblies. Examples include hydro-formed sheet metal details, cockpit panel assemblies, shear clips, skins, complex machined parts and structural assemblies. Platforms include all Boeing commercial airliners, C-17, AH-64, CH-47, F-15, F-16, F-18 and C-130. 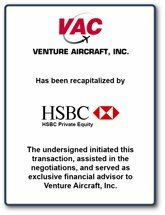 More information on the company's products can be found at www.ventureaircraft.com. 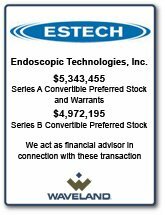 Endoscopic Technologies, Inc. (“ESTECH”) is a medical device company that was founded in 1996 for the purpose of offering cardiac surgeons a wide range of minimally invasive cardiac surgery tools. ESTECH’s EndoAfib™ is a new system of proprietary technologies for the minimally invasive treatment and cure of atrial fibrillation, a condition that affects six million people and for which there is no established standard of care. The company is in the process of finalizing and testing its EndoAfib™ system in conjunction with Cedars-Sinai Medical Center. Following the prior rounds of common stock financing, Waveland was able to structure a Series A Preferred Stock financing at the same valuation as the prior common stock financing almost two years prior, thus gaining an extremely favorable risk adjusted return position vis-à-vis the common shareholders. 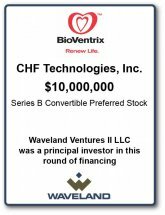 At the conclusion of the initial $4 million in Series A financing, Boston Scientific Corporation (NYSE:BSX) invested an additional $1 million, acquiring Series A shares at a valuation of 2x that of Waveland’s investors. Estech also entered into a strategic distribution agreement with Boston Scientific. ESTECH raised an additional $4.2 million through a Series B venture capital round led by two well regarded life sciences venture capital firms, Psilos and Telegraph Hill Partners, and held subsequent Series C and Series D rounds subscribed entirely by a leading strategic investor at a valuation reflecting a substantial premium over Series A pricing. More information on the company's products can be found at www.estech.com. 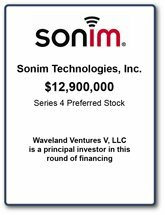 Sonim Technologies, Inc. designs, markets, and sells ruggedized mobile telephones. The Company’s full range of Extreme Performance (XP) handsets, often referred to as the “world’s toughest phones,” provides demanding users mobile technology that supports their work or play activities in extreme environments. To complement the phones, the Company has developed and deployed worldwide location based services (“LBS”) delivered as a service (“SaaS”) over its handsets. Sonim’s mobile and locationenabled platform delivers everything from basic communications to high-performance push-to-talk, push-for-weather, man-down alerts (i.e. accelerometer triggered emergency services) and web applications over today’s wireless data networks - independent of the underlying network or carrier. Sonim sells rugged handsets for use as standalone GSM phones as well as devices bundled together with the Company’s push-to-talk (“PTT”) software platform for a complete end?to?end solution. For more information, please see www.sonimtech.com. Based in Austin, Texas, Wayport is among the leading providers of broadband Wi-Fi and wireline access for travelers and mobile professionals in the U.S. and abroad. The company provides high-speed fixed-line and Wi-Fi (802.11) wireless Internet access in hotel rooms, airports, and meeting rooms, allowing users with laptops equipped with Ethernet network cards to access the Web, company networks, and e-mail for a fee. Major customers include a variety of hotels in the U.S. and Europe and airports such as Austin-Bergstrom International Airport and Dallas/Fort Worth International Airport. The company also operates Laptop Lane, which manages remote business centers in a number of major U.S. airports. Through its acquisition of Netpoint A/S of Copenhagen, which now serves as Wayport's European and Middle East headquarters, Wayport has significantly expanded its presence in international markets. 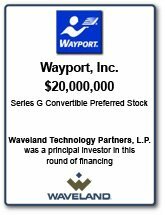 Wayport was backed by leading venture capital firms such as New Enterprise Associates, Sevin Rosen Funds, Invesco Private Equity, and BA Venture Partners. Atrica, Inc. is one of the leaders in the rapidly growing ‘Carrier Ethernet’ segment of the networking equipment market. Atrica competes primarily against Alcatel and Cisco in a market that Infonetics estimates will grow at a compounded rate of 150% per year through 2008. Atrica’s customers include leading telecom providers such as BellSouth, KVH Telecom (Japan), and France Telecom. 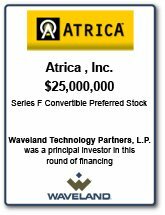 Co-investors in Atrica include Vesbridge (fka St. Paul Venture Capital), Accel, and Benchmark Capital. LGC Wireless is a leading supplier of global wireless networking solutions. The company's products enable high-speed wireless voice and data communications in dense urban areas as well as inside public and private structures. LGC ships its products to customers in over 30 countries and supports all major wireless access standards, including TDMA, CDMA, GSM, iDEN, 1xRTT, Ev-DO, GPRS, W-CDMA, UMTS and 802.11. Denver International Airport, Denver, CO.
Las Vegas Hotel –Casinos: Bellagio, MGM Grand, New York-New York, Golden Nugget, The Mirage, Treasure Island, The Venetian, Aladdin and Mandalay Bay. 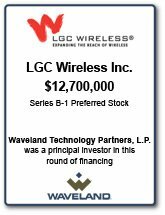 LGC's investors include Rembrandt Ventures, Intel, LG Venture Investment, Panasonic, SAIC, and Mayfield Fund. Good Technology is a leader in the rapidly-growing market for wireless handheld computing software and services for mobile professionals, with over 10,000 enterprise customers, including VeriSign, Bechtel, VISA, O'Melveny & Myers, and Electronic Arts. The company's GoodAccess™ and GoodLink products extend mission-critical enterprise applications, including Microsoft Exchange, Oracle, salesforce.com and Siebel, to mobile employees when and where they need them, using end-to-end AES encrypted, FIPS 140-2 certified security, and cradle-free, real-time synchronisation. The company's solutions are designed to support the widest possible variety of operating systems and devices. 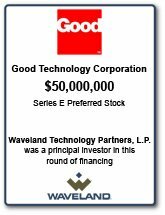 Investors in Good include many of the leading venture capital firms in the world, including Kleiner Perkins Caufield & Byers, Broadview Capital, and Benchmark Capital. 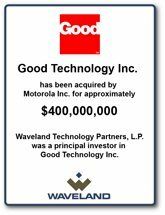 On November 10, 2006, Motorola (NYSE:MOT) and Waveland Technology Partners, L.P. ("WTP") portfolio company Good Technology announced that Good would be acquired by Motorola. We expect that the transaction, which should close in January 2007, will result in a cash distribution to WTP investors of over $1,650,000, or approximately 17% of originally invested capital. The company's website is accessible at www.good.com. 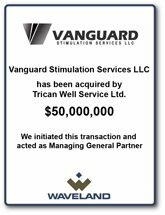 Vanguard Stimulation Services, LLC, an Oklahoma-based oil and gas field service company specializing in the US reservoir fracture stimulation sector, was sold to Trican in March 2010. The Company was formed in October 2007 and is based in Shawnee, Oklahoma, which lies approximately 35 miles east of Oklahoma City. For more information, please see www.vanguardenergygroup.com. 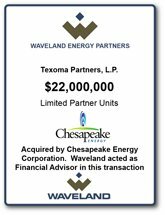 In March 2007, Texoma Partners, L.P. (the “Fund”), a leasebank and pipeline investment fund managed by Waveland Energy Ventures LLC, acquired a 60% working interest in 35,000 leased net mineral acres in the emerging Woodford Shale Play in southeastern Oklahoma (“Texoma” or the “Project”) from Oracle Resources, Ltd. (“Oracle”), an independent oil and gas company based in Dallas, Texas. During 2007, the Fund began the joint development of the Project with Oracle by drilling nine wells and building a pipeline infrastructure. In July 2007, Chesapeake Energy (NYSE:CHK, “Chesapeake”) offered to buy certain working interests and pipeline assets from Oracle and the Fund at a substantial premium to the price paid by the Fund. In late 2007, Oracle closed on the sale of the 40% interest it owned in the Project to Chesapeake. 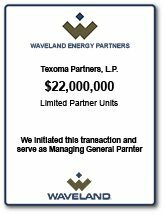 On January 9, 2008, the Fund closed on the sale of 50% of its working interests in the leases it held at Texoma and 100% of its interests in the pipeline. Excluded from the Fund’s transaction were 4,720 acres on which the nine wells were drilled by three Waveland drilling funds. The Fund now owns half of its original 60% interest (i.e., 30%) in the Project, has received in excess of 100% of its originally invested capital in approximately 18 months, retains carried interests in sections where the nine initial wells were drilled, and will continue to receive cash distributions from the future sale of leased acreage and carried interests in future wells drilled by Waveland-managed drilling funds on the Project’s acreage. In addition, the Fund will benefit from the operating expertise of Chesapeake, the most active driller of natural gas wells in the U.S. In addition to the substantial economic return potential to investors in the Fund, the Fund secured a valuable and unique opportunity for Waveland’s drilling fund investors to participate with Chesapeake in what is believed to be one of the highest potential shale-gas plays in the U.S.
Waveland Drilling Partners 2008-A, L.P.
Waveland Drilling Partners 2008-A, L.P., was formed to enable investors to participate with Waveland Energy Partners LLC to own working interests in oil and natural gas properties located primarily in Oklahoma, with the potential addition of properties located in Texas, Louisiana or other geographic areas the Managing General Partner may identify as prospective. The Oklahoma properties are “resource plays” where hydrocarbons are known to be present, whereas properties located in Texas and Louisiana are expected to be predominantly higher impact exploration prospects with higher risk and higher return profiles. The primary objectives of the Fund are to generate revenue from the production and sale of oil and natural gas on its oil and gas properties, to distribute cash to the Investors, to build reserve value with the potential for a profitable divestiture in the future, and to provide tax benefits in 2008 and future years. The Prospects will be developed in conjunction with experienced exploration and production (E&P) companies. Waveland Drilling Partners 2007-A, L.P.
Waveland Drilling Partners 2007-A, L.P. was formed by Waveland Energy Partners LLC to enable investors to own diversified working interests in oil and natural gas properties located in Central and Southeastern Oklahoma, the Texas-Louisiana Gulf Coast, and East Texas. The Oklahoma properties are ‘Resource Plays’ where hydrocarbons are known to be present, whereas the Texas-Louisiana Gulf Coast and East Texas properties are predominantly higher impact exploration prospects with higher risk and higher return profiles. To maintain diversification and mitigate risk, roughly two-thirds of the Fund’s portfolio will be allocated to Resource Play Projects. The remaining one-third of the Fund’s portfolio will be allocated to exploration prospects. Waveland Drilling Partners 2006-B, L.P.
Waveland Drilling Partners 2006-B, L.P. was formed by Waveland Energy Partners LLC to enable investors to own diversified working interests in oil and natural gas properties located in Central and Southeastern Oklahoma, the Texas-Louisiana Gulf Coast, and East Texas. The Oklahoma properties are ‘Resource Plays’ where hydrocarbons are known to be present, whereas the Texas-Louisiana Gulf Coast and East Texas properties are predominantly higher impact exploration prospects with higher risk and higher return profiles. To maintain diversification and mitigate risk, roughly two-thirds of the Fund’s portfolio will be allocated to Resource Play Projects. The remaining one-third of the Fund’s portfolio will be allocated to exploration prospects. 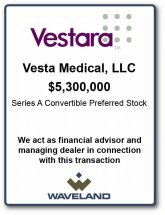 Carefusion 303, Inc., a subsidiary of CareFusion Corporation, acquired Vesta Medical (d/b/a Vestara) in March 2011. Although hospitals and medical clinics most often dispose of potentially dangerous pharmaceutical waste by pouring it down the drain or discarding it in the most hazardous and expensive waste category, Vestara developed a solution designed to reduce both expenses and potential liability for customers. By combining patented bar code scanning technology with a robust IT backbone, this proprietary, automated waste management system helps hospitals identify, classify, sort and segregate pharmaceutical waste, while providing pharmaceutical waste records to facilitate tracking and regulatory controls of more than 180,000 National Drug Codes. Using “scan to dispose” technology, CareFusion’s Pyxis EcoStation system links to the hospital’s pharmacy information system (PIS) and identifies pharmacy-created and manufacturer’s package barcodes, extending use to virtually all pharmacy-dispensed medications. By automating the identification and sorting of different types of residual drugs, empty containers and hospital’s unique admixtures, Pyxis EcoStation system helps to eliminate human error and potential cross contamination inherent in manual sorting of pharmaceutical waste to reduce negative impact on the environment. 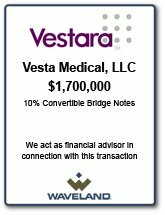 For more information, please see www.vestara.com. Waveland Drilling Partners 2006-A, L.P.
Waveland Drilling Partners 2006-A, L.P. was formed by Waveland Energy Partners LLC to enable investors to own diversified working interests in oil and natural gas properties located in Central and Southeastern Oklahoma, the Texas-Louisiana Gulf Coast, and East Texas. The Oklahoma properties are ‘Resource Plays’ where hydrocarbons are known to be present, whereas the Texas-Louisiana Gulf Coast and East Texas properties are predominantly higher impact exploration prospects with higher risk and higher return profiles. Waveland Drilling Partners 2005-B, L.P.
Waveland Drilling Partners 2005-B, L.P. was formed by Waveland Energy Partners LLC to enable investors to own diversified working interests in oil and natural gas properties located in Central and Southeastern Oklahoma, the Texas-Louisiana Gulf Coast, and East Texas. The Oklahoma properties are ‘Resource Plays’ where hydrocarbons are known to be present, whereas the Texas-Louisiana Gulf Coast and East Texas properties are predominantly higher impact exploration prospects with higher risk and higher return profiles. 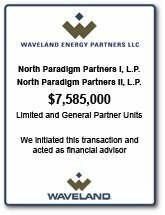 North Paradigm Partners III-B, L.P.
North Paradigm III Drilling Program is a series of limited partnerships which were formed by Waveland Energy Partners LLC to enable investors to own working interests in oil and natural gas properties located in Central Oklahoma. Waveland has partnered with New Dominion, L.L.C. to jointly exploit a unique approach to the development and production of bypassed high water saturation oil and gas reservoirs in Central Oklahoma. The Partnerships are participating in the continuing development of New Dominion’s existing well inventory on the North Paradigm Project in Pottawatomie County and Seminole County, Oklahoma. Agámi Systems has created a new class of network storage called information servers. Agámi's information servers represent a significant advancement in network attached storage (NAS) technology and provide customers with tremendous improvements in functionality, increased performance and capacity, simplified management and dramatically reduced cost of ownership. Transitioning from R&D-stage to revenue stage in late 2005, the company sells its products through major IT distributors such as MOCA and Bell Microproducts. 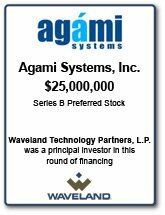 Investors in Agámi include Alta Partners, Apex Venture Partners, New Enterprise Associates, and Kleiner Perkins Caufield & Byers. More information is available on the company's website at www.agami.com. DARA BioSciences, Inc. is engaged in acquiring promising early-stage therapeutic compounds and medical device companies and developing them until they are positioned for sale to a strategic acquirer. DARA believes that one or more of its development-stage compounds could be attractive to ‘Big Pharma’ companies that have lagged the market in recent years as patent protection for many blockbuster drugs has expired and new biotech competition has arisen. In the last four years, at least four development-stage drug companies in the diabetes and neuropathic pain markets in which DARA specializes have been acquired by ‘Big Pharma’ companies for over $150 million each, plus ongoing royalties. Based in Durham, North Carolina, DARA is led by a deep management team hailing from respected organizations such as GlaxoSmithKline, Eli Lilly, and the Duke University Medical Center. For more information, please see www.darabiosciences.com. 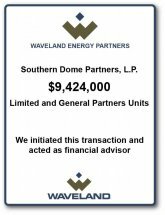 Southern Dome Partners, L.P. was formed by Waveland Energy Partners LLC to enable investors to own working interests in oil and natural gas properties located on the Southern Dome Project within the Oklahoma City Field in Oklahoma County, Oklahoma. Waveland has partnered with New Dominion, L.L.C. to jointly exploit a unique approach to the development and production of bypassed high water saturation oil and gas reservoirs in Central Oklahoma. Southern Dome is a redevelopment of a previously producing reservoir in the Oklahoma City Field, which ranks as one of the top 10 largest oil and gas fields in the history of the U.S.
Aperto Networks is a leader in the nascent but highly promising field of WiMAX communications equipment, delivering the world's most advanced broadband wireless solutions for service providers around the world. The company currently serves over 200 carrier customers across 65 countries and has an installed base of thousands of units. Aperto's wide range of subscriber units, base stations and other equipment allows carriers to profitably offer broadband wireless services in multiple markets via robust and highly scalable networks. The company's carrier-class WiMAX and pre-WiMAX products provide a high degree of subscriber density, quality of service (QOS), manageability, and reliability. 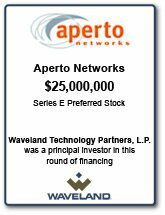 Aperto is a founding member of the WiMAX Forum and serves as chair of the Forum's Service Provider Working Group. Its investors include Canaan Partners, Alliance Ventures, Innovacom Venture Capital, Redwood Venture Partners, Tyco Ventures, JK&B Capital, and Mitsubishi. More information is available at www.apertonet.com. 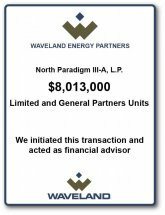 North Paradigm Partners III-A, L.P.
North Paradigm III Drilling Program is a series of limited partnerships sponsored by Waveland Energy Partners LLC, whose primary objective is the creation of income through the production and sale of oil and natural gas. Waveland has entered into an agreement with New Dominion, L.L.C. to jointly exploit New Dominion’s approach to development and production of bypassed high water saturation oil and gas reservoirs in Central Oklahoma. As a result of New Dominion’s success, the company has become one of the fastest-growing producers of oil and natural gas in Oklahoma. The Partnerships will participate in the continuing development of New Dominion’s existing well inventory on the North Paradigm Project in Pottawatomie County, and Seminole County, Oklahoma. The project is situated in an area that historically had only limited production from the Misener/Hunton formations on top of a few minor structures. Previous operators were unequipped to deal with high water production, and thus were unable to exploit the substantial potential of some early completions in this area, which caused the area to be overlooked as a major exploration target for many years. Currently, development is continuing using horizontal drilling techniques proven effective in similar nearby reservoirs. This fund is currently active. IP Unity produces software applications and manufactures servers used to process media functions, including automated speech recognition, interactive voice response, fax detection, and text-to-speech, that its customers use to develop telephony services. Founded in 1999, the company has deployed over 250 systems in over 30 countries worldwide. IP Unity is based in Silicon Valley and maintains a software development center in Bangalore, India. IP Unity product offerings consist of carrier-grade media servers, application servers, and enhanced service applications. IP Unity Mereon media servers are built for high-speed, high-volume media processing (including video), providing for the effortless deployment of a variety of high-margin enhanced services on standard PSTN, broadband, wireless and next generation networks. The copmany's Mereon application servers feature robust development and deployment frameworks, modular and flexible designs, and a proven architecture able to simply combine telephony, Web and data sessions into a singular unified communications experience. The company also offers a variety of in demand applications including unified messaging, auto attendant, prepaid, privacy screening, conferencing and collaboration. To ensure customers' systems are up and running as fast and efficiently as possible, IP Unity also offers a variety of professional services and training options. 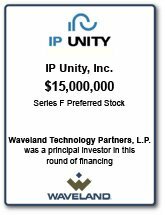 Included among IP Unity's investors are New Enterprise Associates (NEA), Battery Ventures, Partech International, Siemens Venture Capital, and Kleiner Perkins Caufield & Byers (KPCB). More information is available at www.ipunity.com. 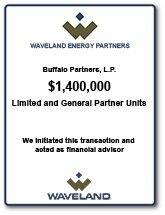 Buffalo Partners, L.P. was funded in May 2004 and drilled a total of three wells in Leon County, Texas. The partnership sold 100% of its assets in November 2005. Combined with previous distributions made to investors during the operations phase of the partnership, the sale provided a total return to investors of 272% of their total investment in the partnership in 19 months, equating to an internal rate of return of 95%. Prior to the sale of the assets, the partnership had already distributed to investors over 105% of invested capital. The Buffalo partnership was a single prospect ‘exploratory impact’ program. Alien Technology is the leading 'pure play' provider of technology for the rapidly growing radio-frequency identification (RFID) market, which is anticipated by ABI Research to grow to almost $9 billion by 2009, up from $3.2 billion at the end of 2006. Alien specializes in the manufacture and marketing of low-cost, high-volume RFID tags using its patented Fluidic Self Assembly (FSA) manufacturing process, which allows for large quantities of small components to be placed on a surface during a single operation. The company also makes readers used to detect and track the tags and is a leading provider of RFID training programs through its RFID Academy. Alien tags and readers are used in applications such as inventory management, logistics, transportation, pharmaceutical tracking, security systems, supply chain management, and vehicle asset tracking. 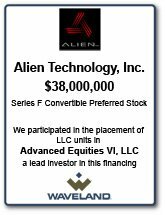 Alien has raised over $200 million in venture capital from a variety of leading institutional investors, including New Enterprise Associates, Sevin Rosen, Rho Ventures, CMEA Ventures, and Dow Chemical. 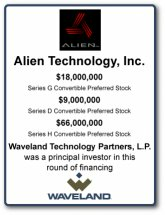 More information is available at www.alientechnology.com. 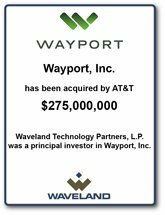 Wayport is backed by leading venture capital firms such as New Enterprise Associates, Sevin Rosen Funds, Invesco Private Equity, and BA Venture Partners. The company maintains a website at www.wayport.com. Waveland Drilling Partners 2005-A, L.P.
Waveland Drilling Partners 2005-A, L.P. was formed by Waveland Energy Partners LLC to enable investors to own diversified working interests in oil and natural gas properties located in the Texas-Louisiana Gulf Coast and East Texas. The properties are geologically distinct, separate ‘high impact’ exploration prospects that have been developed in conjunction with experienced exploration and production (E&P) companies. Founded in February 2000, Atrica has emerged as the prominent market visionary and leading provider of Carrier Ethernet solutions for Metropolitan Area networks. Atrica's mission is to help carriers worldwide realize dramatic cost savings and enable compelling new business services based on its advanced Carrier Ethernet solutions. Atrica is widely recognized by leading service providers and industry influencers for taking a strong industry leadership position, promoting and delivering on its compelling vision: combine the performance and cost-effectiveness of Ethernet with crucial carrier-class features to change the landscape of Metro Area Networks and carrier services. Atrica is based in Santa Clara, California, with R&D facilities in Israel and sales offices throughout Europe, Asia Pacific and North America. More information is available at www.atrica.com. 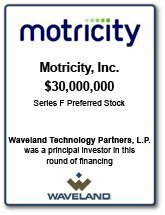 Voltari Corporation (NSDQ: VLTC), announced the completion of the corporate reorganization of Motricity, Inc. in which Voltari replaced Motricity as the publicly traded parent of the Voltari and Motricity businesses. The change, which includes a new ticker symbol (NSDQ: VLTC), took effect on April 10, 2013. Through its industry-leading Motricity Fuel™ content distribution platform, Motricity offers thousands of software titles to run on a wide variety of handheld devices. Offering world class technology and services, Motricity provides mobile operators, MVNOs, media and entertainment companies, OEMs and other distributors with the opportunity and technology to leverage the emerging mobile channel to connect with customers, increase sales and build brand loyalty. Motricity is the leader in 'Mobile Marketplace Management' solutions, featuring a catalog of more than 600,000 digital media titles, reaching over 120 million consumers worldwide. Motricity creates compelling user experiences and delivers profitable mobile content offerings for partners such as BET, Cingular, Sprint, Virgin Mobile, Sony Ericsson, Ask, Verizon Wireless, China Unicom, O2, Amazon.com and Palm. The Motricity Fuel™ Mobile Marketplace Management Suite received the 2006 GSM Association Award for "Best Service Delivery Platform" and was also named "2005 Premium Mobile Content Platform of the Year" by Frost & Sullivan. Motricity also operates a network of consumer Web sites that offer applications for mobile devices, including: eReader.com, PalmGear.com, Pocketgear.com, Smartphone.net, SymbianGear.com and Mobile2day.de, and powers similar web sites for customers such as the Sony Ericsson application shop, the Palm Software Connection and the PalmSource shop. The company's financial backers include New Enterprise Associates, Technology Crossover Ventures, Intel, and Noro-Moseley Partners. More information can be found at www.motricity.com. 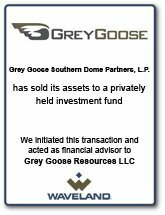 Grey Goose Southern Dome Partners, L.P.
Grey Goose Southern Dome Partners, L.P. was funded in August 2003. The partnership's assets were sold in July 2005 for a 142.2% pre-tax return of investor capital. Livingston Energy Partners, L.P. was formed by Waveland Energy Partners LLC to enable investors to participate in a waterflood project in the Livingston Field in Livingston Parish, Louisiana. The use of waterflood technology is widespread in the energy industry and is one of the most widely applied methods of “secondary” oil recovery. This project is a re-initiation of a waterflood that Amoco had previously performed at Livingston and consists of additional drilling of infill wells. In addition to this promising system, ESTECH is engaged in developing a number of other unique technologies designed to improve cardiac health. Currently, the company holds four patents with 12 additional patents pending. CHF Technologies, Inc. d/b/a BioVentrix has developed and is marketing the Blue Egg™ Sizer, its first generation of a series of proprietary technologies for the treatment of congestive heart failure, a large and growing market traditionally treated by drugs, which typically alleviate only the symptoms of the disease but do little to treat the underlying condition. Market research firm Medtech Insight estimates that by 2008 there will be 1.6 million potential patients for left ventricular restoration procedures for heart failure sufferers, which the company estimates translates into a market opportunity for BioVentrix of $6.7 billion. The company owns or exclusively licenses eight patents protecting its technology and is engaged in developing the second and third-generations of its heart failure treatment, each of which is designed to be less invasive and to serve larger markets than the last. For more information, please see www.bioventrix.com. Waveland Drilling Partners 2004, L.P.
Waveland Drilling Partners 2004, L.P. was formed by Waveland Energy Partners LLC to enable investors to own diversified working interests in oil and natural gas properties located in the Louisiana Gulf Coast. The properties are geologically distinct, separate ‘high impact’ exploration prospects that have been developed in conjunction with experienced exploration and production (E&P) companies. Grey Goose Energy Partners 2002, L.P.
Grey Goose Energy Partners 2002, L.P. was funded in December 2002. 100% of the partnership's assets were sold in September 2004 for a 116.8% pre-tax return of investor capital, including prior distributions from operations. Investors in the partnership also received an up-front tax deduction equal to 95% of their investment. North Paradigm Partners I and II, L.P.
North Paradigm Partners I, L.P. and North Paradigm Partners II, L.P. are a series of limited partnerships which were formed by Waveland Energy Partners LLC to enable investors to own working interests in oil and natural gas properties located in Central Oklahoma. 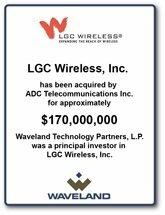 Waveland has partnered with New Dominion, L.L.C. to jointly exploit a unique approach to the development and production of bypassed high water saturation oil and gas reservoirs in Central Oklahoma. The Partnerships are participating in the continuing development of New Dominion’s existing well inventory on the North Paradigm Project in Pottawatomie County and Seminole County, Oklahoma. 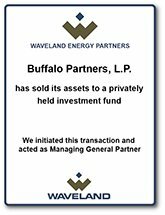 Buffalo Partners, L.P. was sponsored by Waveland Energy Partners LLC with the primary objective being the creation of income through the production and sale of oil and natural gas located on an exploration prospect located in Leon County, Texas. 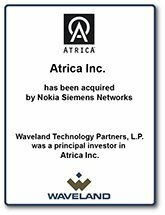 The partnership was funded in May 2004, and sold 100% of its assets in a transaction that closed in November 2005, realizing a 270.7% pre-tax return of investors capital, including prior distributions from operations. This fund was terminated following the sale of the partnership assets. King’s Ridge Partners, L.P. was sponsored by Waveland Energy Partners LLC was formed by Waveland Energy Partners LLC to enable investors to own working interests in oil and gas wells drilled at the King’s Ridge Prospect in Lafourche Parish, Louisiana, located 30 miles south of the city of New Orleans. King’s Ridge is a redevelopment of a previously producing field, utilizing up-to-date technology. The use of state-of-the-art 3-D seismic technology applied to these older producing fields has enabled geologists to identify untapped reservoirs within them and to identify additional locations whose structural advantage over existing wells makes them ideal developmental targets. Waveland Drilling Partners 2002A, L.P.
Waveland Drilling Partners 2002A, L.P. was formed by Waveland Energy Partners LLC to enable investors to own diversified working interests in geologically distinct, separate ‘high impact’ oil and natural gas properties. The prospects, located in Texas and Louisiana, have been or will be developed in conjunction with experienced exploration and production (E&P) companies. 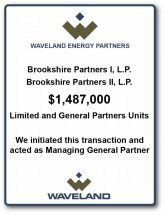 Brookshire Partners I, L.P. and Brookshire Partners II, L.P. were sponsored by Waveland Energy Partners LLC to enable investors to own working interests in wells drilled on the Brookshire Dome Prospect located in Waller County and Austin County, Texas, approximately 40 miles west of Houston. Brookshire I was bought out in early 2002, returning 100% of the investors' capital. Brookshire II was subsequently formed in April of 2002 and sold 100% of its assets in a transaction that closed in April 2007. Combined with previous distributions made to investors during the operations phase of the partnership, the sale provided a pre-tax return to investors of 170% of the total capital invested in the partnership. 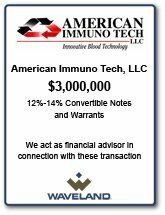 American Immuno Tech, LLC (“AIT”) was founded in 1995 to design, develop, manufacture, and market cost-efficient, state-of-the-art medical devices for the disposal and treatment of surgical fluid waste and the non-chemical treatment of blood-borne infections. At his prior firm, Waveland CEO Michael Greer sourced this transaction in 1998 and led both a bridge financing in late 1998 and an equity financing in the first two quarters of 1999. During the equity financing, with the assistance of Mr. Greer and his firm, the company negotiated the sale of its Neptune™ fluid waste management system to Stryker Corporation (NYSE:SYK) for a multi-year royalty payout estimated to ultimately exceed $30 million. In 2001, AIT again approached Mr. Greer, this time at Waveland, and solicited the firm’s help in securing interim bridge financing in advance of a renegotiation of its royalty agreement with Stryker. Waveland successfully secured $3 million in bridge financing, which was paid off in full less than one year later in 2002. AIT continues to pursue the development of its HemaCharge™ technology for the non-chemical treatment of septicemia, the third-leading cause of death in hospital intensive care units, as well as two additional medical technologies.